If you want to restore your Firebird to exact factory specifications, these OEM type cables are what you need! Each 1967-69 cable is reproduced exactly as original using the same OEM type spring terminals and connectors. 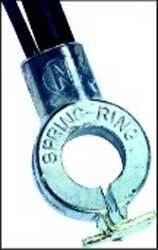 The terminal end includes the w ord SPRING RING in the correct type style and size. Each cable is produced for authenticity and includes the original wire markings. Positive and negative cables are sold separately, due to the variety of cables which were used for different applications. Each reproduction includes the correct length cable and spring ring terminal end.